At a time of heightened tensions between the U.S. and China, it comes as little surprise that a new and important book on the bilateral relations, published by a think tank affiliated with the Chinese Foreign Ministry, should have the foreboding title The Twilight of a Feast on Power: The U.S. “Rebalancing to the Asia-Pacific” and China’s Countermeasures. Although the book, published in July, largely tracks a familiar narrative of the irreversible decline of the U.S. cast against the unstoppable ascent of China, it also contains a notably nuanced interpretation of Washington’s intentions. The book’s key finding is important: “The objective of the U.S. policy towards China is ‘hedging’ but not ‘containment.’” China’s rise is presenting opportunities, challenges, and uncertainty, it notes, which compel Washington “to take actions to guard against and mold China” as it tries to ensure China’s development benefits rather than threatens American interests. This is a more sober assessment than the usual indignant howls about American containment pervasive among China’s foreign policy analysts a couple years ago and still popular in the nationalist state media. The book, authored by a group of researchers at the China Institute of International Studies (CIIS)—of whom only one, Ruan Zongze, is named— theorizes that Washington’s “rebalancing” has matured alongside its views of China. 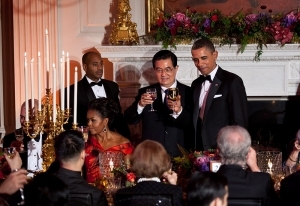 Presidents Hu and Obama toast during a State Dinner in the State Dining Room of the White House, 2011. Such “oscillations” were typical of a relationship between “neither enemies nor friends,” say the authors. Viewed from Washington, however, bilateral ties appear to have been in linear deterioration. As Xi Jinping tightens his grip on power, clamps down on civil society, projects China’s formidable economic might in apparent challenge to America’s global influence, and flexes his muscles over China’s maritime claims, more and more voices in the U.S. foreign policy establishment are doubting whether a cooperative relationship is possible. Although they are still in a minority, a growing chorus questions the fundamental wisdom of engagement with Beijing, arguing it has failed to either bring about domestic political liberalization or shape China into a responsible stakeholder in the U.S.-led liberal world order. Mainstream opinion in the two capitals nevertheless seems to be converging on the broad outlook. But even if both countries are becoming more clear-eyed about the competitive nature of their relationship, their ability to manage the rivalry peacefully will hinge on reconciling yawning divisions on key flashpoints, most notably the maritime disputes that pit China against Japan in the East China Sea, and against several Southeast Asian nations in the South China Sea. In sharp contrast, the widely-held view in the U.S., and among the aforementioned countries, is that it is China that has ratcheted up tensions. For them, actions such as declaring an East China Sea air defense identification zone, deploying an oil rig to waters disputed with Vietnam, and enlarging reefs in the South China Sea into potential military outposts have pushed frightened neighbors to seek support from Washington. Next to a decaying America, the book portrays a triumphant China, taking its place in history to forge “an Asian community of common destiny.” China’s “new Asian security concept” that promotes “security for all, by all, and of all” is a compelling alternative to U.S. alliances that pursue “absolute security of a single country,” the authors write. China’s “Silk Road Economic Belt” and “21st Century Maritime Silk Road”—ambitious development plans—will propel the economic takeoff of Asia, Europe, and Africa, it predicts. “Asia has woken up and calls for Asian people to take charge of Asian affairs,” The Twilight provocatively proclaims. Despite the melodramatic triumphalism in the pages, however, one of the authors, Cui Lei, allowed for more subtlety. For years, Beijing’s foreign policy has been partially based on the unspoken assumption that America’s decline in Asia is as inevitable as China’s eventual regional supremacy. Although this new CIIS book does not challenge that narrative, a growing number of China's foreign policy thinkers realize that the sun may not have quite have set for America the superpower; China’s leadership in Asia is far from ordained; and its policy settings need to be adjusted for medium to long-term co-existence rather than unchallenged regional authority.